We are so appreciative of all the amazing teachers that provide lessons for the Earthschooling curriculum! 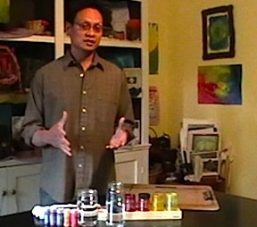 If you are an Earthschooler you have probably seen at least one of Rick Tan’s wonderful black and white drawing, anatomy, or watercolor videos (that he made exclusively for Earthschooling) or perhaps you have seen his amazing Elizabethan chalk drawing – also made exclusively for Earthschooling. We have some exciting new lessons from Rick going online this week so I thought you might want to get to know him a bit better and read some of his fantastic tips for teachers! Q: How many years have you been a Teacher? A: For over ten years. Q: You are a doctor. What inspired you to switch from medicine to teaching? The root of why I wanted to enter medicine was to serve humanity, to be a servant for others (this is something that may have come from my time at Jesuit High School). I realized I can serve humanity through education as well – and be able to have more time with my family, and get to incorporate other things I enjoy doing such as art and music. Q: You are very artistic. Have you been artistic since you were a child or did you study art or practice a lot? A: I suppose art came to me early – I remember being very proud of drawing a bird for my grandfather when I was five years old, and he encouraged me to keep a good eye for the beauty of nature that surrounds us. Q: When you were in grade school and middle school what were your favorite subjects? A: In the younger grades, I think playtime and recess were my favorites. In middle school, I enjoyed language arts. Q: Did you think you would be a teacher when you grew up? If not, what were your career aspirations as a child? A: I did not know being a teacher was even a profession – I think as a kid I did not think in those terms. As a child I did not aspire to a particular profession, but I did imagine myself as a director of movies (I thought George Lucas was the coolest! ), and an artist and inventor (like Leonardo da Vinci). Q: You have done a couple wonderful watercolor videos for Earthschooling that have been really helpful to members. This is a new medium for a lot of teachers and parents. What are three tips you can offer that would help them be most successful? A: Tips: 1) MAKE FRIENDS WITH WATER – Go with the flow as the outcome of the painting really is a combination of your imagination and the water’s inherent elemental power! 2) KEEP IT SIMPLE – Stay away from trying to achieve realistic details – you’d be surprised how the eye will create an image from something that is “close enough”. 3) LOVE THE PROCESS – Make every step of your work the thing that is most important in the moment – don’t make it about the final product. Q: Everyone loves to share their best watercolor paintings online. A lot of parents and teachers are worried that their watercolor paintings don’t look like the ones they see online. Having been in a Waldorf classroom I’ve seen a wide range of painting styles and levels even though the teacher offered the same lesson to everyone. People become very focuses on the final result. However, there are other things that are important in the activity. What are other important aspects to Waldorf watercoloring that are not “the final result”? The fluid flow of your hand and brush is in itself a meditative activity. The use of color itself – not the form or content – is an exercise in evoking feeling, emotion, and expression, and appreciating beauty in the relationships that arise from the colors on the page. Developing discipline in the start to finish of the lesson is an important virtue. In itself, the watercolor activity, balances your day because it allows for a time where you can slow down, be creative, harmonize your thinking, feeling, and doing. Q: You created a wonderful drawing and anatomy video for Earthschooling members. What do you hope teachers and parents learn from this lesson? Why do you think this lesson is important to your students? A: The anatomy lesson for Earthschooling was a fun one to assemble! I discovered in my striving for balancing science and art, that Andreas Vesalius’ book, which included the most accurate anatomical images of the time, did just that: it presented the human body in such a beautiful and informative way. I wanted to offer that same kind of reverence for my students. At the same time, the cross-hatching allowed for the development of a fine artistic technique that is worth developing. Students and parents alike could benefit from the skill-building and the opportunity to see the human body in a different light. Q: How much time to you take to prepare for each Main Lesson for your classes each day? Do you have a planning schedule for yourself? Do you have times that you plan more or less (like do you take extra time in the summer to prepare for the year)? A: Each teacher and each block/subject have different preparations. I think I spend the most time preparing for history lessons, less on anatomy/physiology, maybe because of my background. In the summer, I will have outlined my year and the blocks I will teach. I try to gather resources also in the summer. During the year, I look at our Waldorf curriculum guidelines and standards to align with what language arts skills need to me met and work that into the lessons, assignments, and projects. I enjoy writing my own plays (I have written an original play every year – and the last one was a musical about the Salem Witch Trials!) In my opinion, it is one I consider to be a very Waldorf thing as a teacher to provide for his/her students. It allows the teacher to really reflect on the students of the class, and pedagogically, through customizing individual characters for each student, it offers something special and unique for their development. I add this here because in my planning time, I devote two weeks of either a winter break or spring break to the task (depending on when I felt we would be able to work on and perform the play). Q: Does it help your planning when you already have lessons planned (because you perhaps used them in another class or another teacher or someone gave you the idea or plan)? How does this help you? What additional work do you do with lessons that are already planned out? A: Having previous reference material is certainly helpful, but I find myself tweaking the lessons to make it my own and because the students are different, the day is new, the energy is in the moment, you have to make adjustments so the work is always living and dynamic and fresh. Q: What non-Waldorf resources do you use in your classroom? I have a Waldorf teacher friend who uses math problem printables from an online site to send home as homework with some of her math students. Are there other resources that are not “traditionally Waldorf” that you have found enhance and enrich your student’s experiences? A: I would say that I strive to present the lessons in a Waldorf manner, but frankly, the resource materials (books such as anatomy books, periodicals like national Geographic, online sources like Wikipedia, language arts textbooks and workbooks, and a host of other references) are often not born from Waldorf. Q: You are also a musician. Do you feel that your music influences or helps your art or that your art influences your music? How? A: Fascinating question – I love it! I recently had a conversation with my daughter Joey about math and eurythmy. I posed to her the question: Can learning math in five periods per week be as effective as four periods of math and one eurythmy class? She does not think so – math, she believes, is learned through drills and repetition. She is neither wrong nor right, but, my point was that our activities have a synergistic effect on other activities we engage in. We can certainly see how, for instance, a good body self-image affects our relationships. For me, my art and my music may act as synergistic forces that feed my soul. Inversely speaking, my spirit sparks the creative force that influences my art and my music. Q: What is your favorite kind of pizza? If I was not in a household of vegetarians and picky eaters – I would love a pizza with mushrooms and anchovies! Q: If someone gave you a plane ticket to anywhere where would you go? A: I would ask for the generous patron to make sure to give me tickets for my whole family, and we would go visit our children’s mixed heritage: the Philippines, China, England, Armenia, and Yugoslavia. Q: What is a book or movie that most influenced you or that you appreciated most in the past year? A: A magazine: National Geographic, they are currently doing a special issue on food, and the first issue had the article, “Five-Step Plan to Feed the World,” which proposed a way to feed a growing population and implement better agricultural practices. Q: If you were to able to follow one bird around all day and see what it sees what bird would it be?